Raven next to an iceberg. 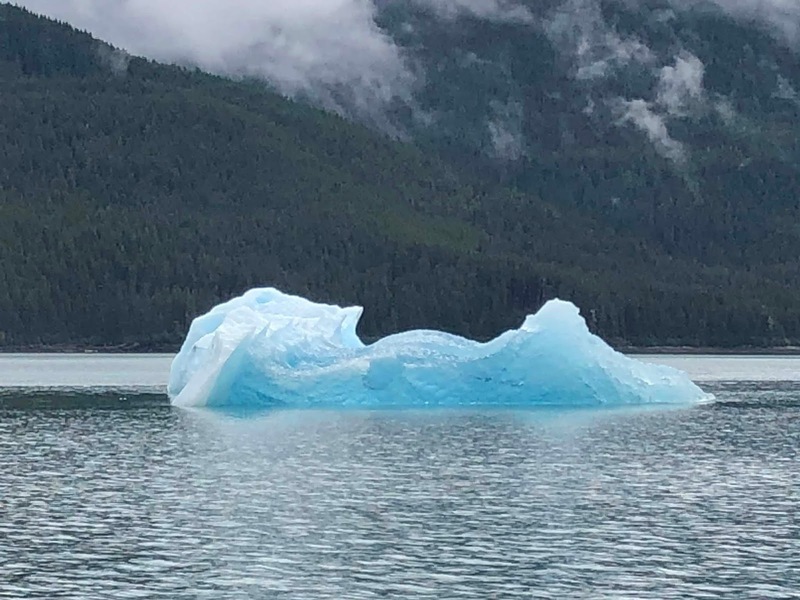 No, we didn't reach the Antarctic, it's a half-acre-sized Alaskan iceberg in Endicott Arm. 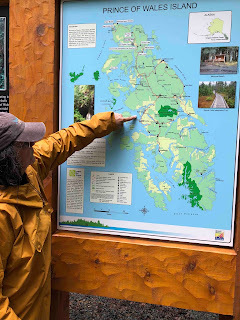 We are in Craig, a settlement of 1200 people on western Prince of Wales Island, in the southwest corner of Southeast Alaska about 60 miles north of Dixon Entrance. 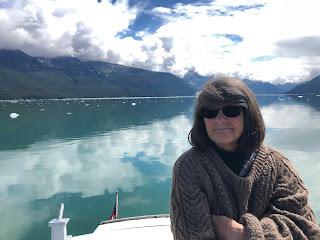 We’ve been threading our way among and between large and small islands and there was a short, mercifully calm passage in the Gulf of Alaska. 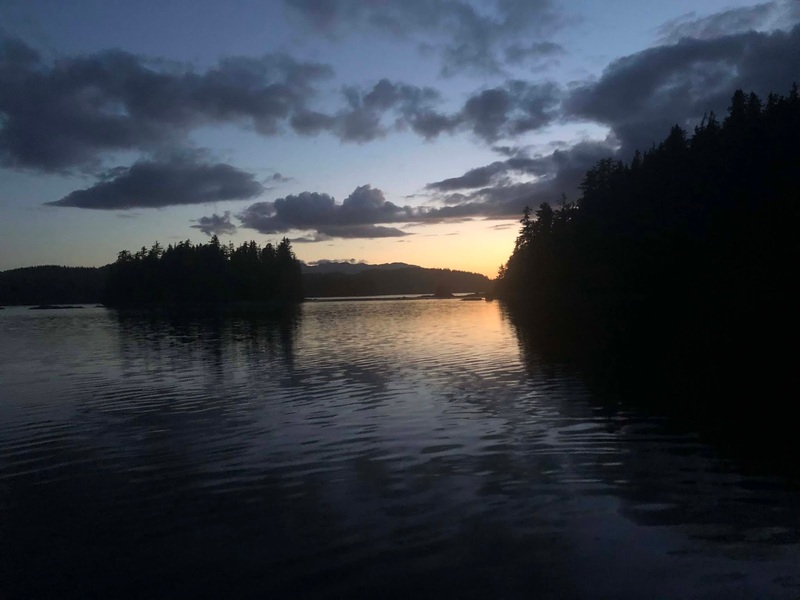 Craig, the largest settlement on Prince of Wales Island. 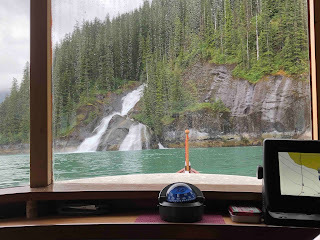 It’s been awhile since our last post because we have been in the boonies since leaving Juneau. Jim, who has been going barefoot for most of this trip, kept checking his cellphone for a signal, but nada. Do you think, he said, if I put shoes on we might get service? There are so many picturesque neighborhoods and nifty historic structures in Juneau. You just have to walk uphill (or be driven on a tour, thanks Deb!) The tourist district is cool, but so are the areas away from it. 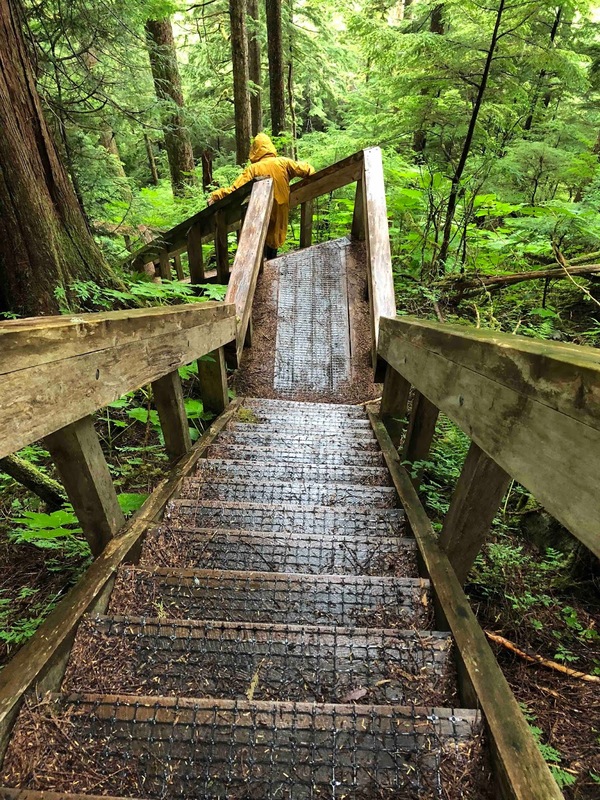 Juneau is also a paradise for hikers. 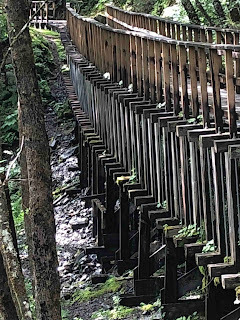 This trail is built right on top of a large flume, and you can hear the water rushing under your feet. It also drips out the sides. This is an outlet of the flume, way up a mountain. 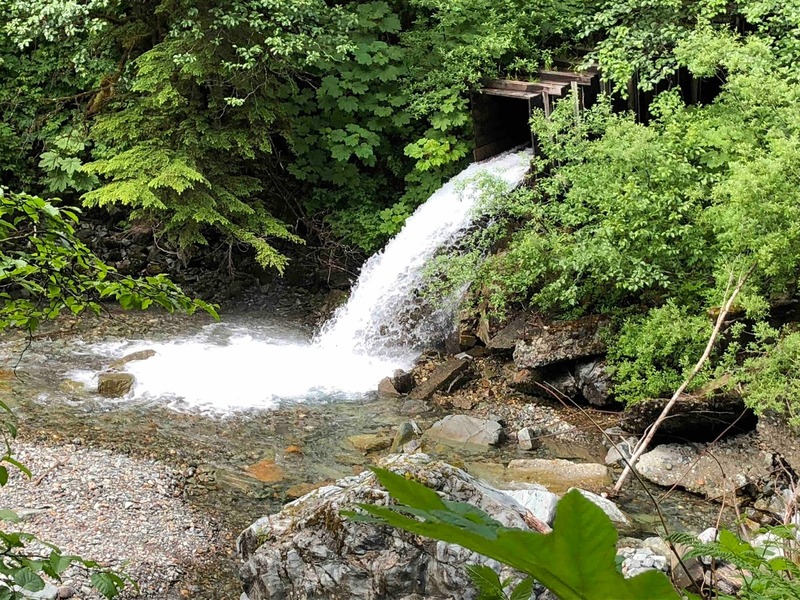 Other hikes in the area would appeal to both novices and experienced hikers. 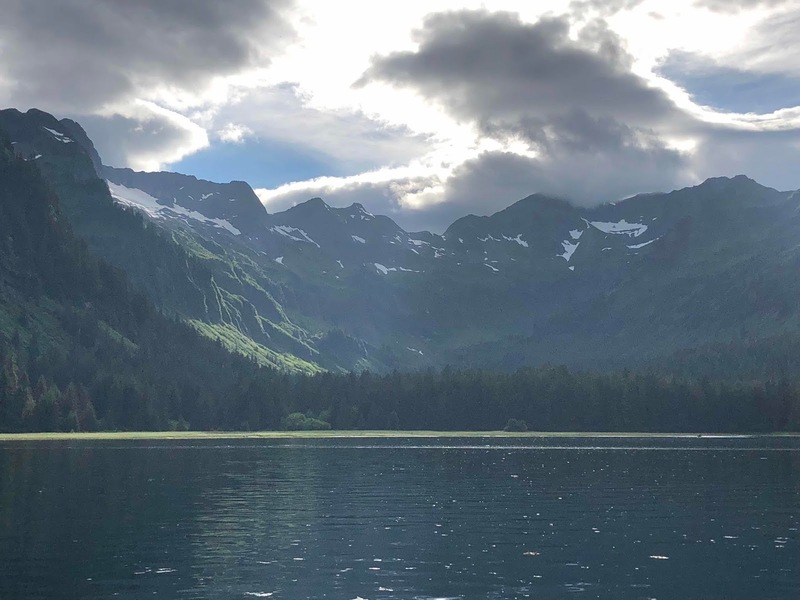 It is also a fact in Gastineau Channel that when two cruise ships pass by, their wakes will bounce you around for the next twenty minutes. Time to get away from cruise ship traffic. We have traveled nearly 350 miles since Juneau, most of it in the kind of wilderness where human beings are reminded and humbled that we’re just another part of a magnificent and often achingly gorgeous planetary ecosystem. We have been to the ice. We have seen glaciers, and blue icebergs bobbing like a spill of rough-edged Canada Mints. 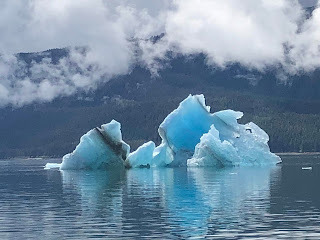 We have seen icebergs shaped like giant moths, icebergs as big as houses, no, bigger than houses, and we have seen killer whales and humpback whales. We have seen black bears, brown bears, get-outta-town bears, a wooly mammoth… okay, not a wooly mammoth. 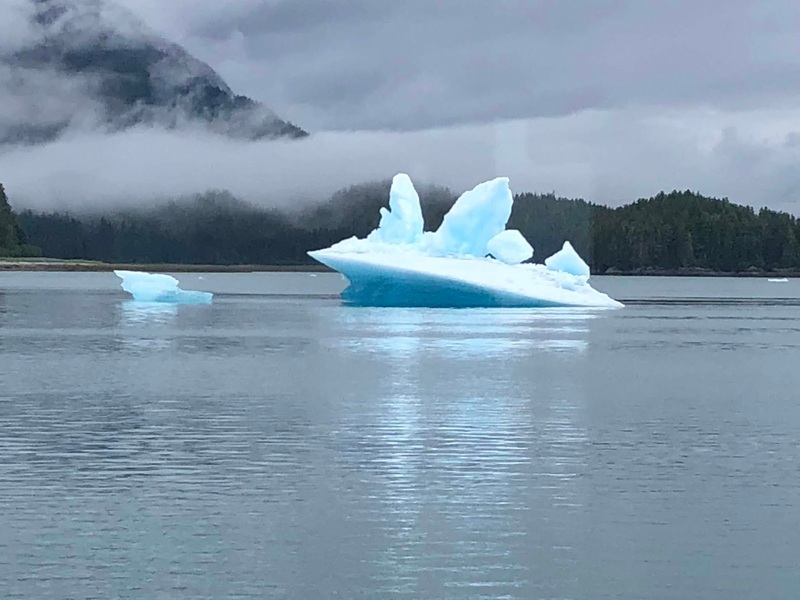 Don’t you think this iceberg looks like either a giant moth or, perhaps, the Starship Enterprise after it grew Barbaloot antennae? 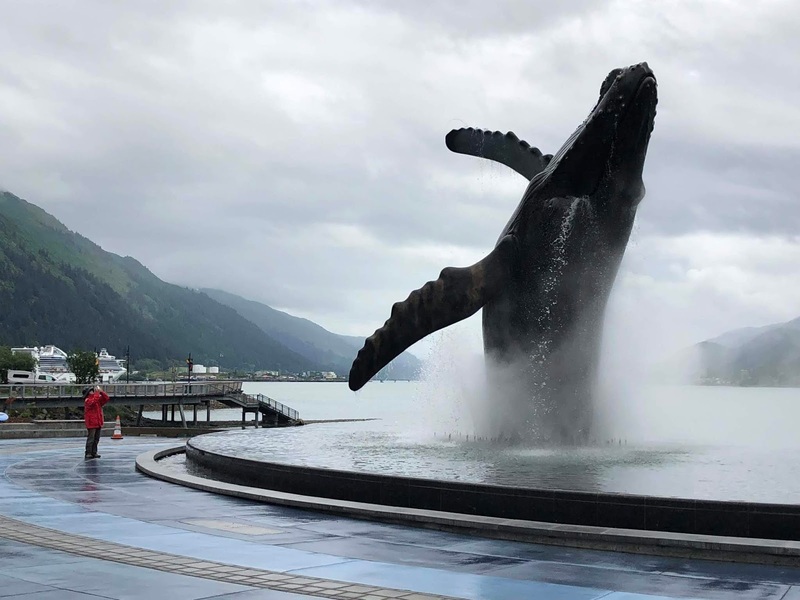 But we digress… there we were on the Juneau waterfront, innocently taking a selfie when THIS happened! Can you believe it? 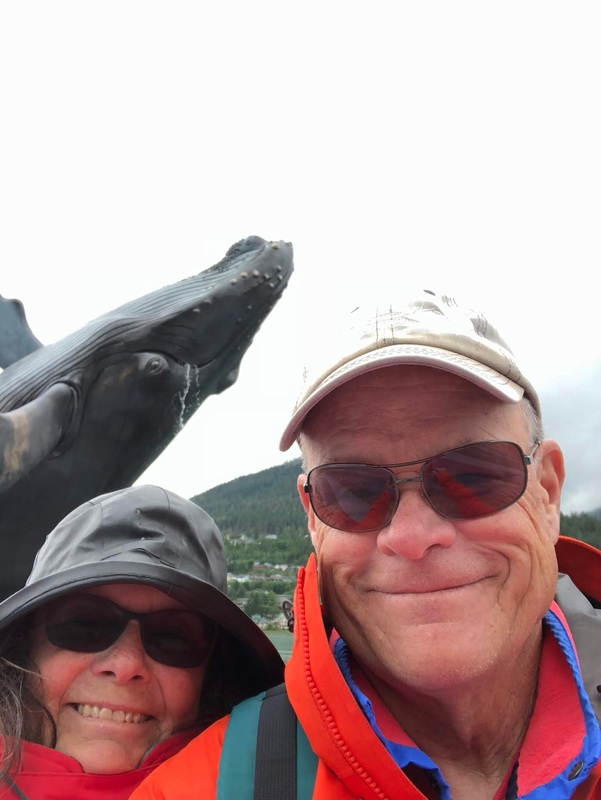 I mean, REALLY, the nerve of that whale, photobombing us like that. Several friends have admonished us: We wanna see more wildlife pictures! We don’t care, they said, get out there and get those photos! Okay then. I texted the photo below to a friend, and wrote: You wanted to see a whale close-up? She texted back: WOW! AWESOME! 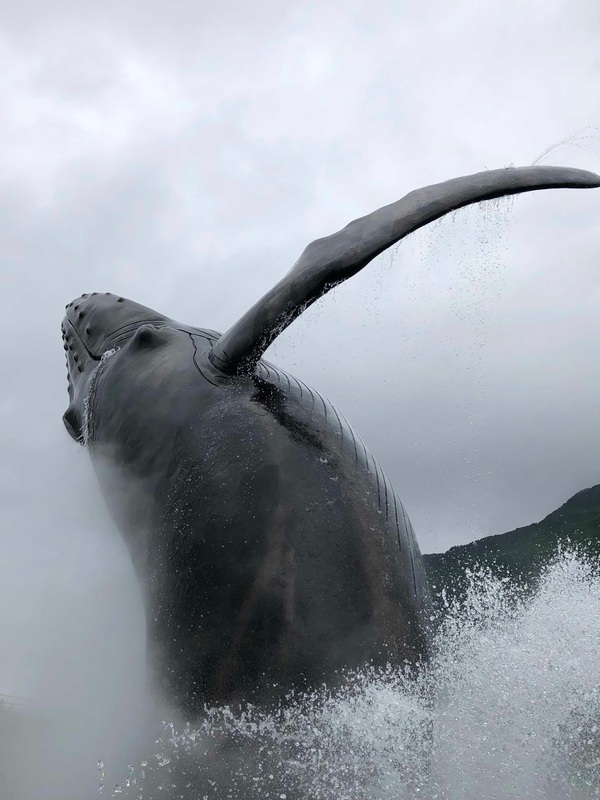 Was that a humpback whale? Love it! Thank you! Me: Couldn’t wait ‘til April 1. Also, if I’d been that close to a breaching whale with an iPhone trying to get a shot like that, it woulda been the last photo I ever took, because, as you can see from relative species sizes in this photo, there wouldn’t have been much left of me to write home about when that whale came back down. We left Juneau on June 29, but because a southerly wind raised a chop, we pulled in 20 miles south to anchor at Taku Harbor, then continued the next day to Tracy Arm, which has not one but two big glaciers at its head, about 25 miles from its ice-choked entrance. And there’s another huge arm, Endicott, to explore after Tracy. Picture a large Victorian 3-storey house and you’ll get an idea of the size of this chillpuppy in Endicott Arm. 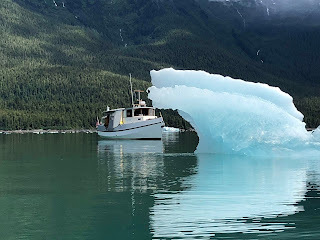 June 30 was a majorly big day, because we got up at oh-dark-thirty so we could get to Tracy Arm, then went the full length of it up and back, and finally anchored late that evening in a pocket cove near the fiord’s mouth, hoping no bergs would drift in. 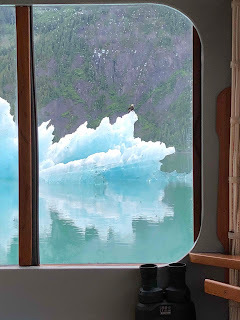 You’d think icebergs might have enough sense to not clog the narrow entrance, but noooo. 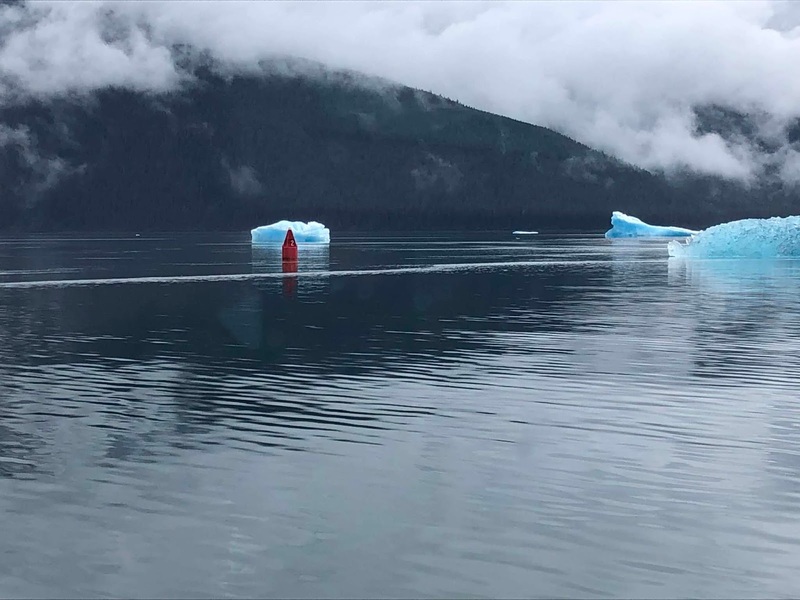 When we crossed this bar the next day to go up Endicott Arm, icebergs had left the red nun alone but swept away the green can. Given the fresh paint on both aids to navigation, we don’t think this is a rare occurrence. Luckily, there’s a range on an island that you can line up to stay in the channel. Jim: So if you get off the range, are you deranged? Me: You would go aground and have to get a tow a-ranged. Jim: Costs could range quite high. 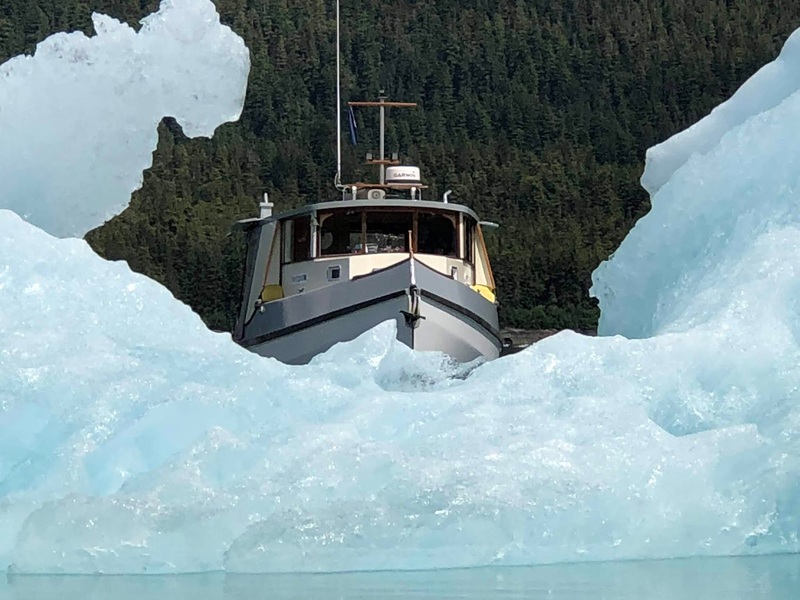 Me: And blaming an iceberg would be st-range. 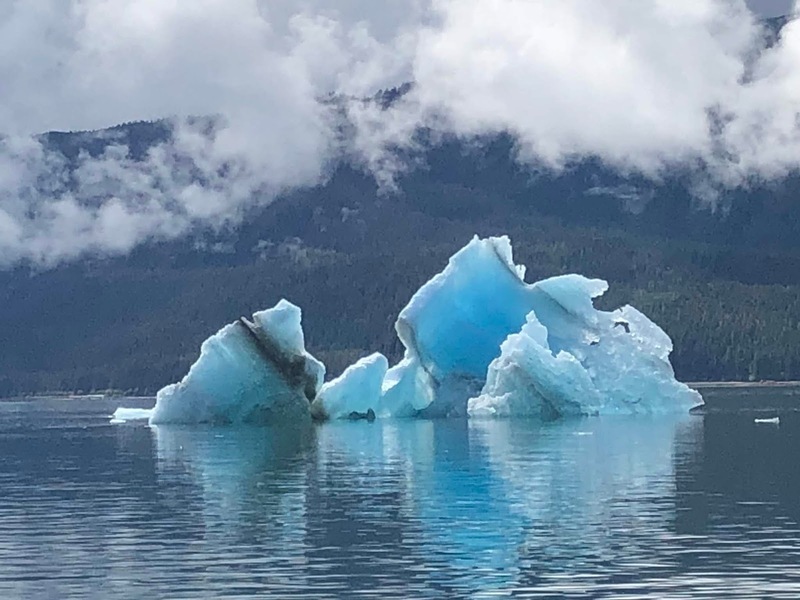 Doesn’t this iceberg look like if Dale Chihuly decided to sculpt a sea slug in glass? 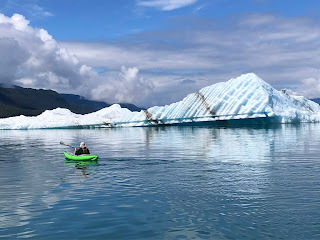 The varied blue colors in icebergs and glaciers surprises people. 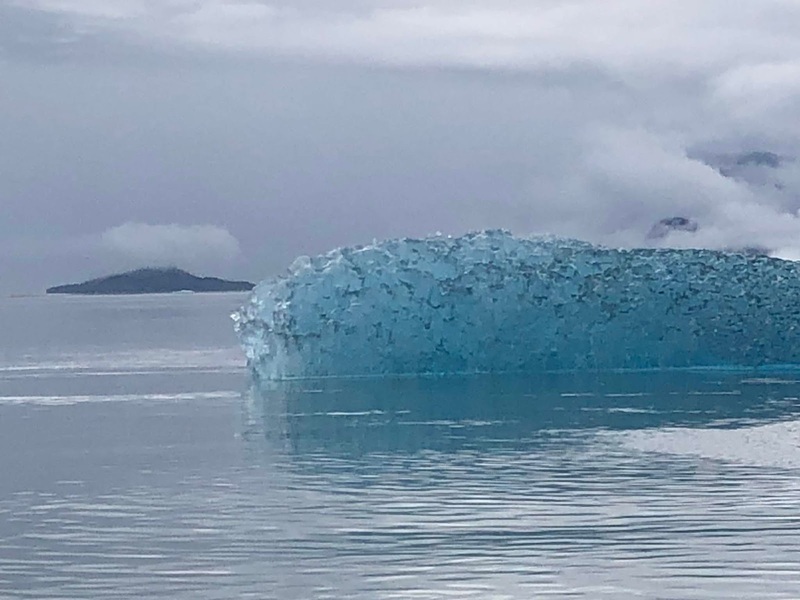 It turns out that when you compress all the air out of ice over time, say ten millennia, the way it refracts and reflects light changes, and you get this blue-green color because all the long-wavelength light (meaning, red) is absorbed rather than reflected. Unfortunately, the ice we made drinks from wasn’t blue, but we enjoyed its ten thousand year-old, what would you call it, paleo-seasoning? We liked the wave-forms in this berg, which was about the length of a bus. 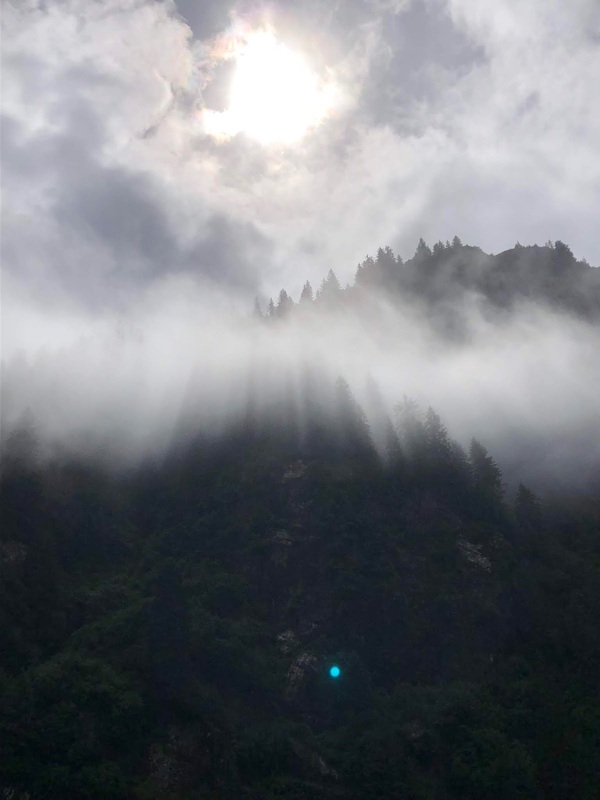 We had to come over to investigate this cataract rushing off the mountainside, and it was worth it. It rained on and off that day, which only added to the beauty because of how the light played with low clouds while the rain fueled dozens of waterfalls. 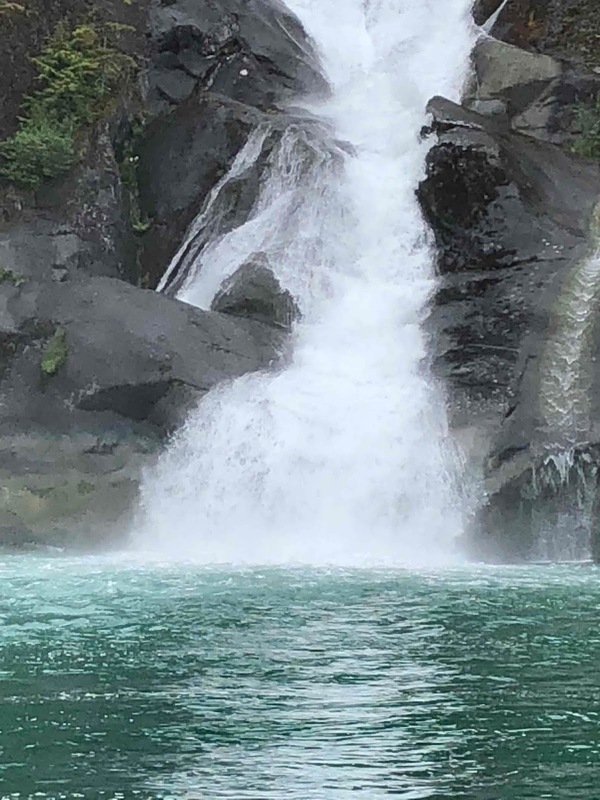 Close-up of waterfall. 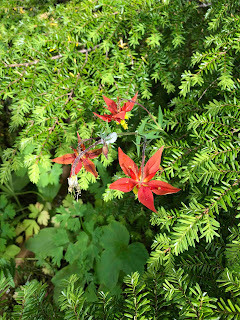 It was mesmerizing to watch because it continually changed shape around the edges. More water at play, like a feather boa. Seriously, how does a cloud do that? 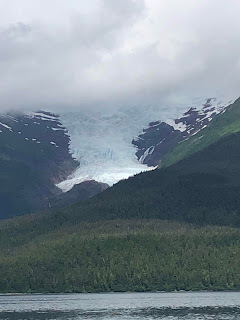 Look at the glacier way, way up the mountain, and the U-shaped opening it carved when it once filled the whole valley. 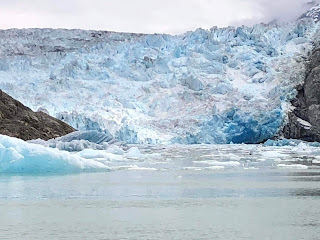 A lot of these photos show the incredible (and alarming) rate of retreat of these glaciers, too many of which may be gone within our lifetimes. 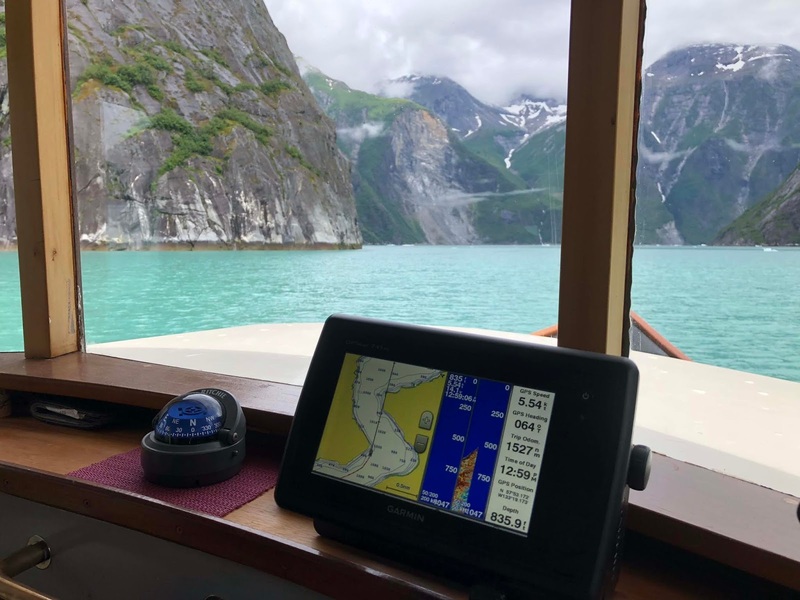 Now this was intriguing; a couple of near-90-degree turns in Tracy Arm—why? What would cause a glacier to have to do that? We don’t know, but this was the path it followed, and now we’re following in its watery wake. 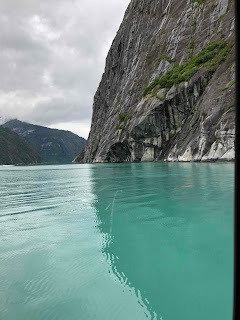 The color of the water was an opaque turquoise, evoking along with the surrounding forests and mountains, the sense that had the movie “Avatar” been about glacial rather than tropical habitat, it might have been filmed here. 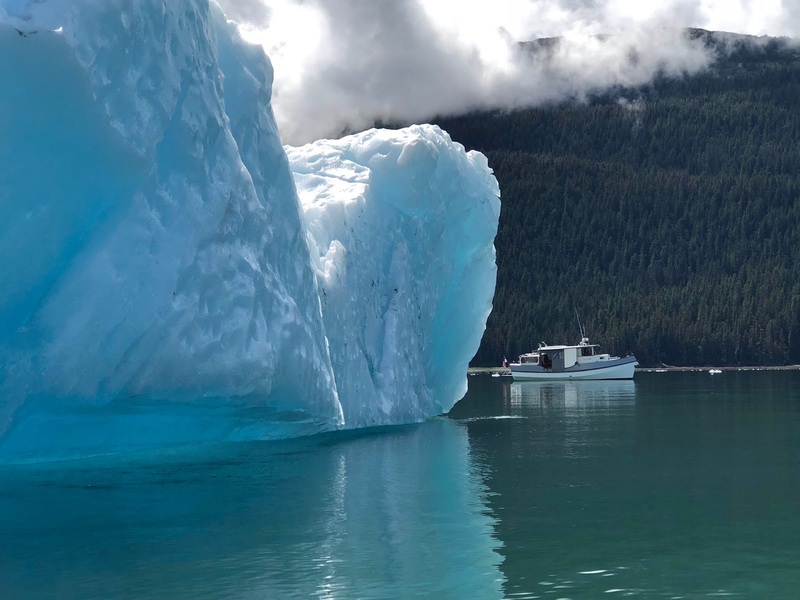 The rumbling South Sawyer glacier is extremely active and calves at the head of Tracy Arm—it’s the source for all the big icebergs in that Arm. 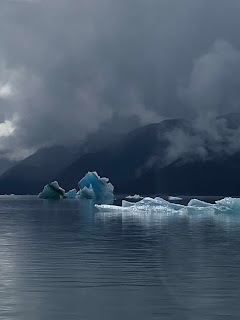 It was so choked with ice that we couldn’t get much nearer than this. Many of the small bergy bits had seals with pups resting on them, so it was just as well to not disturb them. Mamas would watch us and put a protective flipper over their pups to reassure them, just like human mothers do, except without the flipper. We had read that you can get quite close to North Sawyer glacier, and we did. 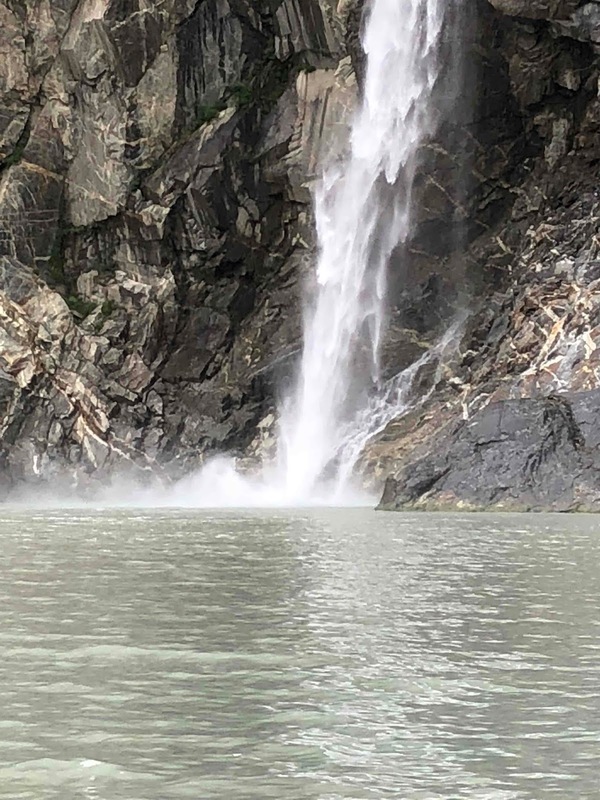 Along the way, waterfalls like this one squirted out of mountainsides. 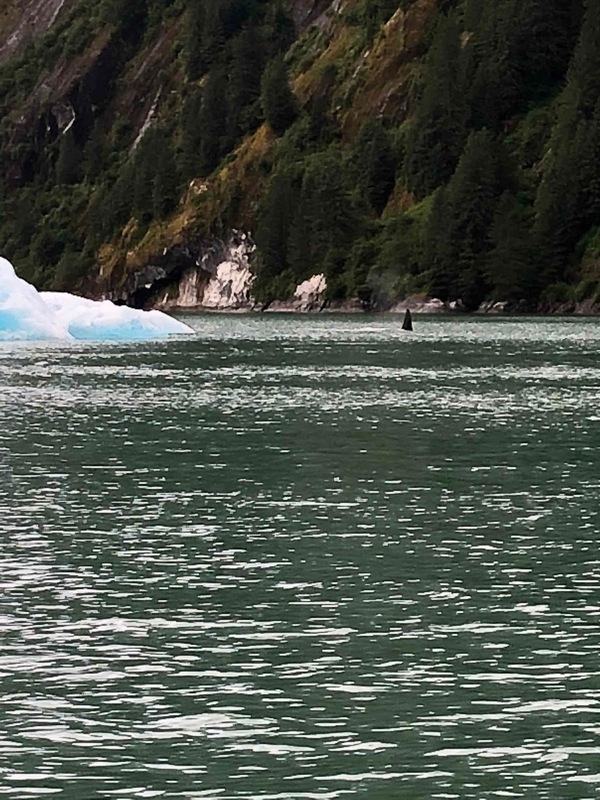 The volume of fresh water coming out of Tracy Arm is tremendous. This is probably the most disturbing photo. If you look at the screen, the red triangle is where Raven was—more than half a mile “inland” since this chart was made. 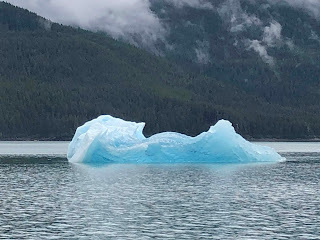 And we were still a half-mile from the glacier! 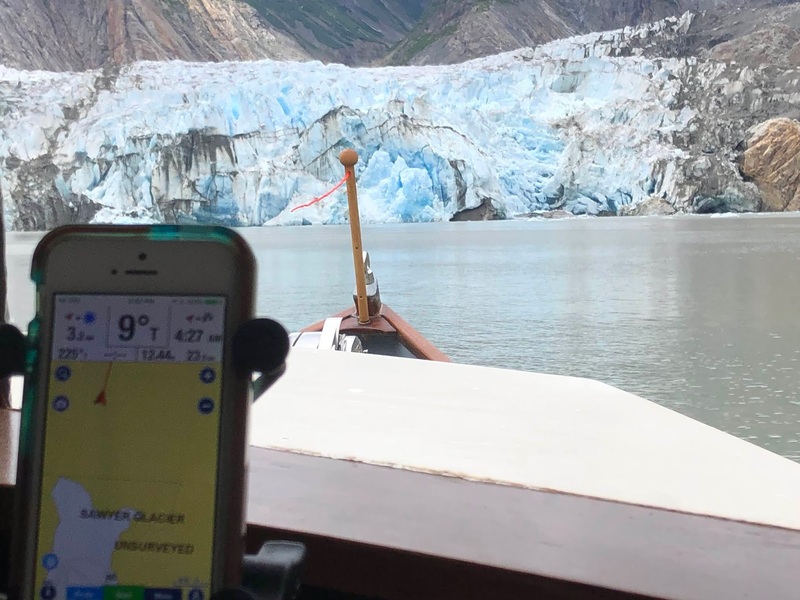 The chart says, “Sawyer Glacier – Unsurveyed.” Meaning nobody’s been out here to measure the depths and correct the chart in such a brief time; the retreat has been this dramatic. We liked the symmetry of this view of Raven as she bobbed in front of North Sawyer glacier. Gotta hand it to shipwright Leif Knutsen, he designed and built one terrific boat. Heading back down Tracy Arm, we were less than two or three boat lengths from the sheer rock walls bordering the fiord, and it was a thousand to twelve hundred feet deep! Orcas! 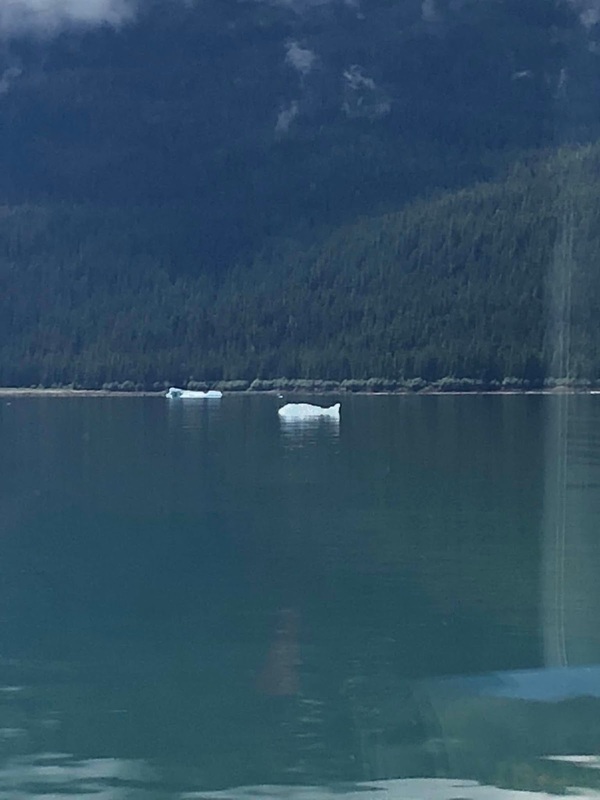 Two of them swam behind this iceberg. This dorsal fin belongs to a big male. And then! 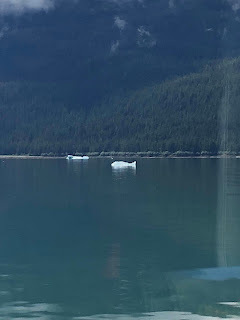 We didn’t get a photo of this because it would have looked like a small dark blob, and besides, we couldn’t tear ourselves away from the sight of it long enough to grab a camera, but I noticed something moving—it looked like another “stump” swimming across the ¾-mile wide fiord. What’s that, I said, thinking, oh, it’s probably just a very dark small moose, and raised my binoculars. OHMYGOD, IT’S A BEAR SWIMMING! A very large brown bear was paddling along in the frigid water, semi-vertical like a person treading water, shoulder hump held surprisingly high, neck and head well out of the water, round ears alert, eyes constantly looking around, and an expression on its face, I swear I am not making this up, exactly the opposite of a large fierce carnivore and precisely like one of those cute Teddy Bears kids put on their beds. It was doing the best imitation of a smile that a bear could possibly do; we have rarely seen an animal looking so pleased with itself. Its nose was also going a mile a minute, trying to sniff out the Irish stew and cornbread we had cooking on the stove, and while it was tempting to motor closer for a better look, we didn’t, because even a big get-outta-town grizzly bear who’s trying to cross ¾ miles of icy water probably has its paws full, logistically speaking, so best not to bother it. 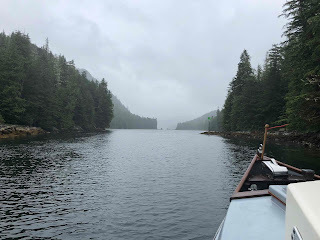 Plus, claw marks on the hull would not be fun, and it was clear from the interest it was showing in Raven that the bear might have approached us for a hearty helping of stew, and then maybe a second one, and after that it probably would have eaten the dish and spoon, too, and demanded all the Oreos on board. And then it might have demanded our stash of Miss Vickie’s potato chips, which would be a bridge too far. Me: Aww, it looks almost huggable! Jim: Tell me you didn’t just say that. Me: Man, this place is like a glacial Jurassic Park! Icebergs make great perches for eagles and other birds. 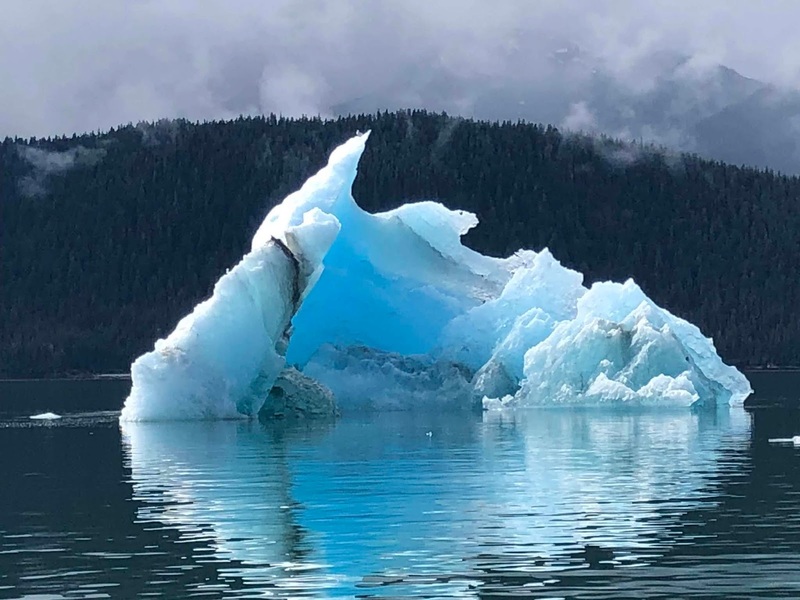 Jim: I don’t know about you, but when I see an iceberg, I look for it on the chart. Do you do that? Jim: Well, I’m going to write to Navionics after this and complain about the icebergs not being on the chart. Jim: Especially when they’re so close to navigation aids, right? Day two, our attempt to get up Endicott Arm. The way the sun played on these icebergs, and shone through them to make the blue luminous, was astoundingly beautiful. It’s hard to take a bad photo in a place like this. Whaaaat? 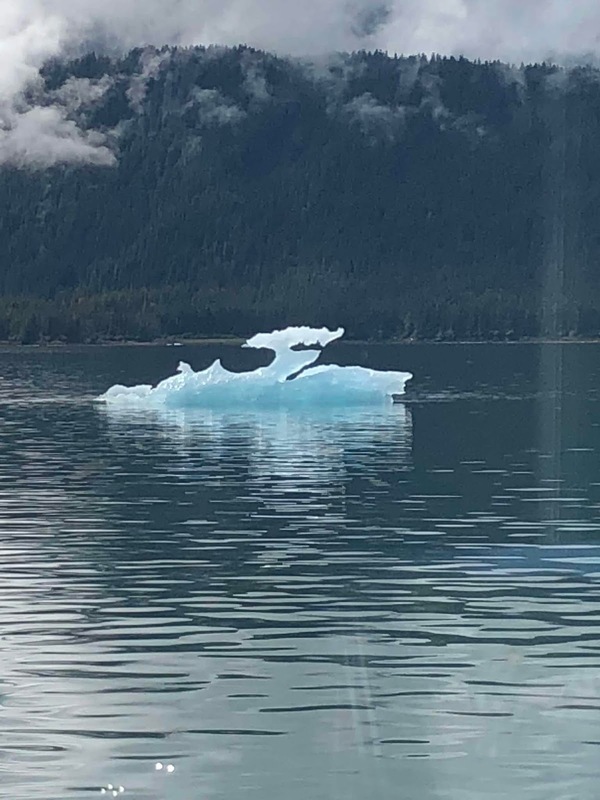 An Epsilon-shaped iceberg? We got fraternities up here? We went up on the roof for a better view. Okay, Sweetie, don’t get too close to these bad boys. I swear to god, Raven is not as close to this iceberg as it looks. Okay? Fun with perspective. Raven was well away from this frozen tsunami, but Jim found the money shot. Sumdum glacier no longer reaches the water. 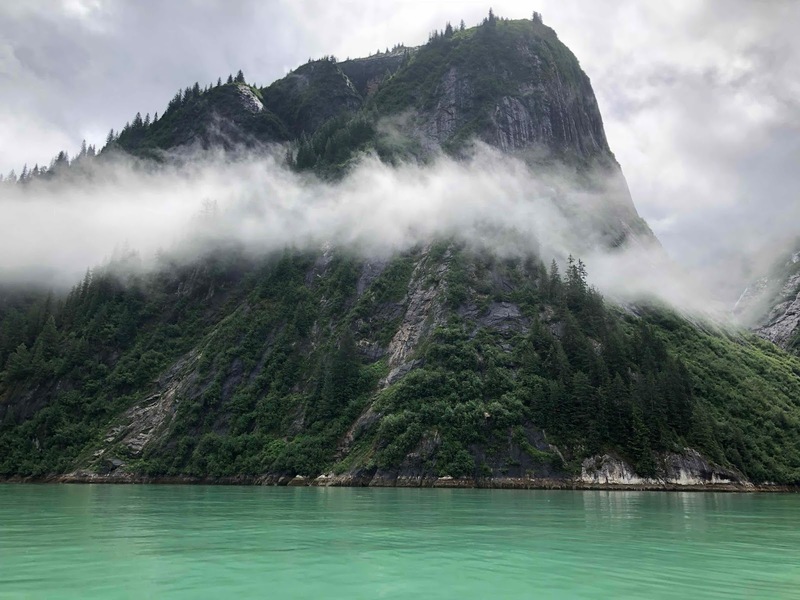 Our little pocket cove at the mouth of Tracy Arm. Tune in to BearTV each night at seven for crunch ‘n munch drama on the shoreline! So that’s the Tracy-Endicott Arm adventure. 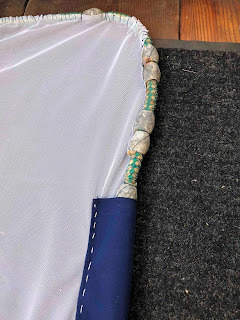 The warm sunny weather was bringing out the bugs, and I made a mosquito net for the forward hatch that uses some spare lead line we had lying around to weigh it down instead of having to screw snaps into the wood. (If it gets windy the bugs disappear anyway.) It’s heavy so it’s wind-proof, has the lead line covered with blue fabric so it won’t mar the surface of the wood, and it can be rigged/de-rigged in a hurry. Cannery Cove in Pybus Bay is very scenic. 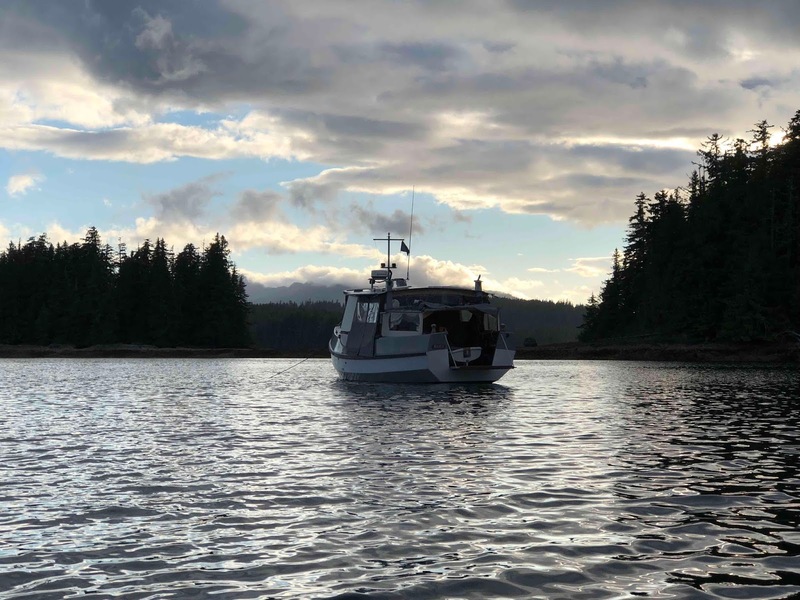 We were anchored with a 38-foot pilothouse sloop named Northern Light, and invited its owner, Danny, and his sweet little Chihuahua, Bella, over for dinner. Leaving Cannery Cove we crossed Frederick Sound again, this time in flat calm. Blog posts sometimes get written on the run. 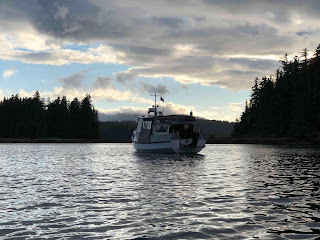 Anchored in Cedar Cove, Security Bay we could see that it was going to get rolly by evening, so we moved to anchor behind Cleft Island, and oh my, was that ever animal heaven or what. Ravens yelled OOOOH! WAH! like an arachnophobic grandma being startled by a large spider, songbirds warbled like an orchestral flute section, sea otters floated on the surface with fat round babies sleeping on their stomachs, eagles flew overhead, a black bear turned over rocks on the beach, salmon jumped, a whale blew outside the harbor, and if you could visualize a quintessential late evening near-biblical “cornucopia of animals in harmony” sunset scene, this was it—except for the two young seals that had a big fight right off our stern. Punks. 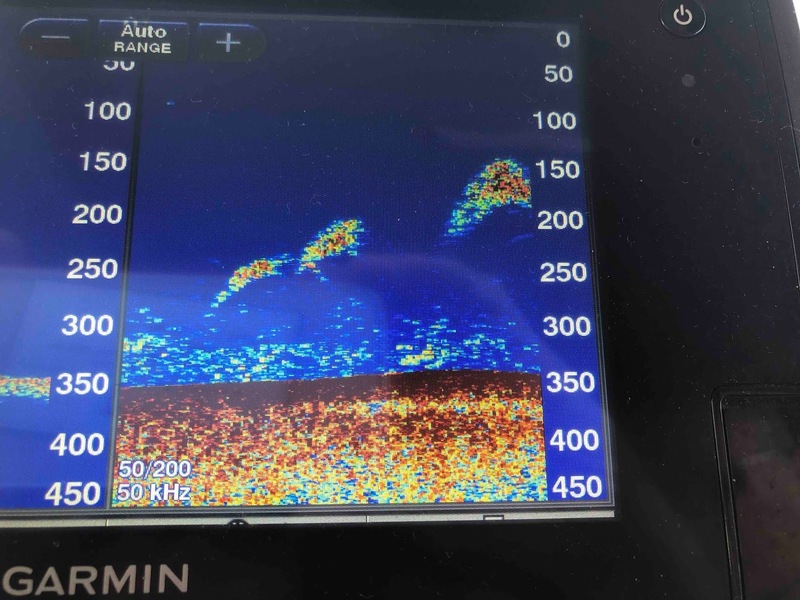 And when we looked at our depth sounder, we saw this. Whale-shaped schools of fish, or whales, what do you think? A cruising couple we met said, You MUST go see Tebenkof Bay, there are so many places to anchor and it’s off the beaten path! So we did, found a wonderful spot and set Raven up in “lounge mode” that included the sailing dinghy ready for dashing sorties across the bay. 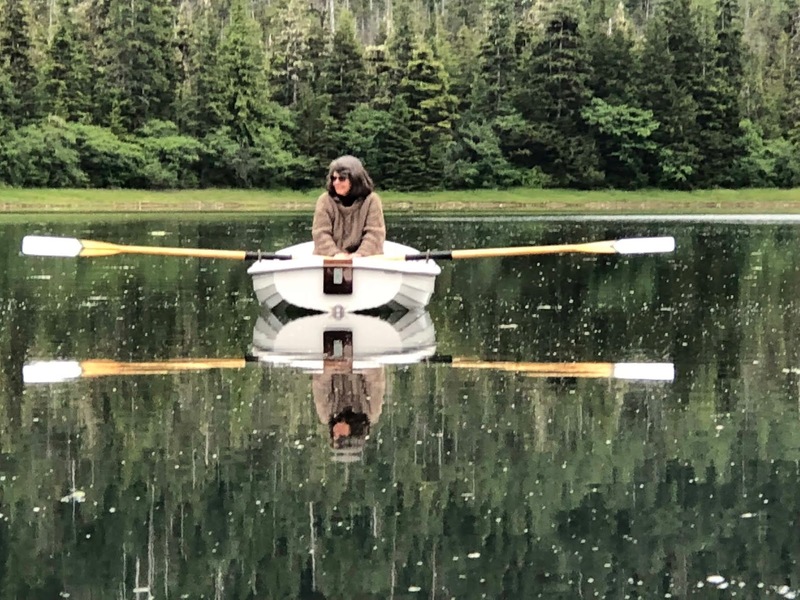 Karen sailed it and the wind died after Jim tried it and had to row back, so he went fishing. 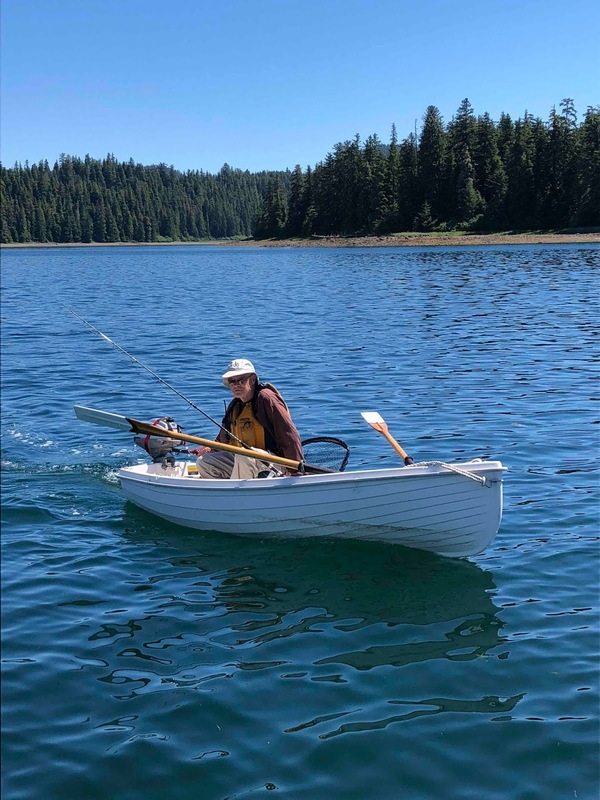 Here he is returning with the dinghy in fishing mode, but you can see from his expression that he got skunked again, dang it. 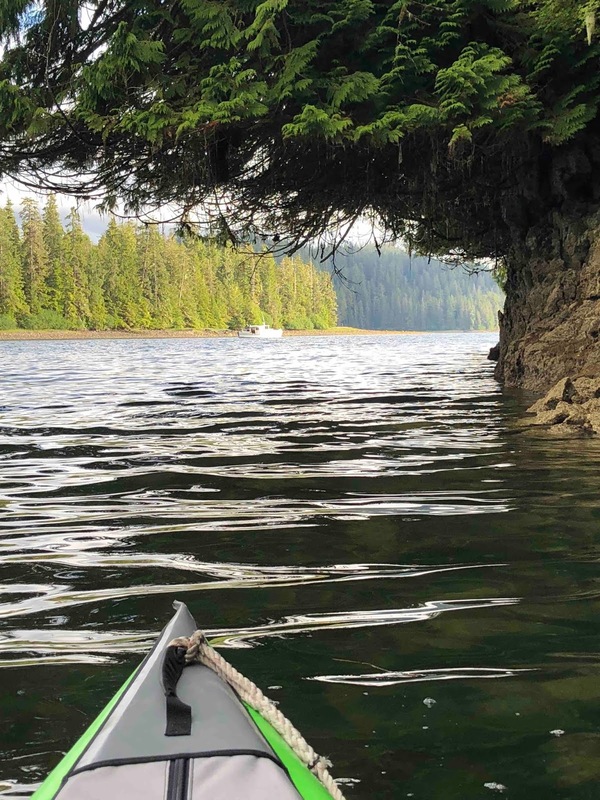 As consolation he rowed to the nearby island and hiked its old-growth mossy mini-forest. 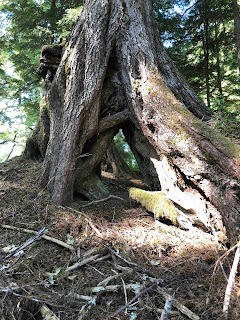 Surprises like this tree, which had grown from a stump of an ancestor tree that has since rotted away, along with thick soft moss everywhere, made up for catching no fish. Well, not really, but it was nice. After a couple of calm sunny days in the far back reaches of Tebenkof Bay, where horseflies should really be called clydesdale flies (plus they need an air traffic controller,) we decided to steam toward the bay’s entrance to see if we could find a cell signal or a VHF signal out in the strait, for a weather report. 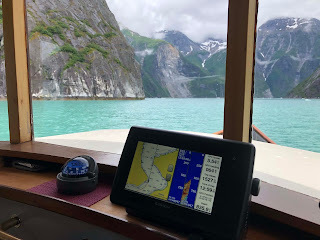 The idea was to get the forecast, steam back to another anchorage in the bay, and wait for a calm weather window for our passage in the Gulf of Alaska (or should I say GULP! of Alaska) in order to round Cape Decision on the south tip of Kuiu Island. 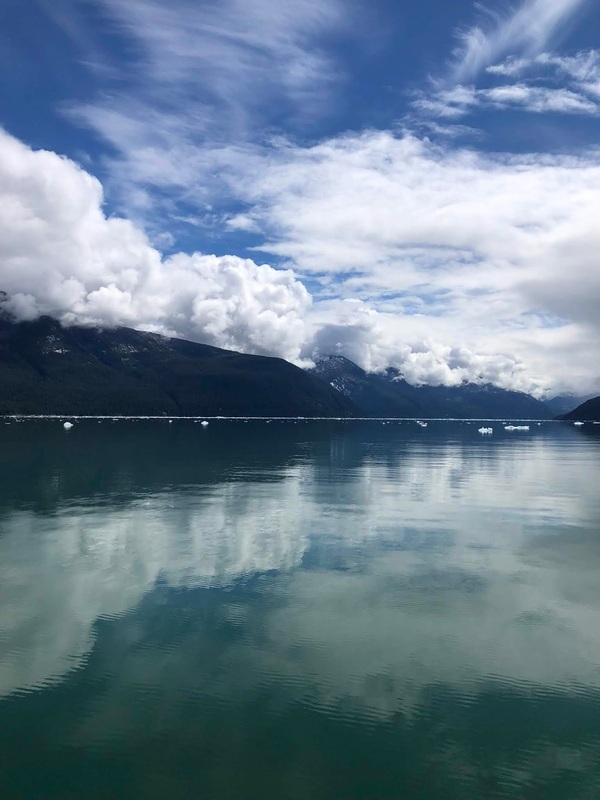 Yep, this was the Gulf of Alaska. Coronation Island in the distance. 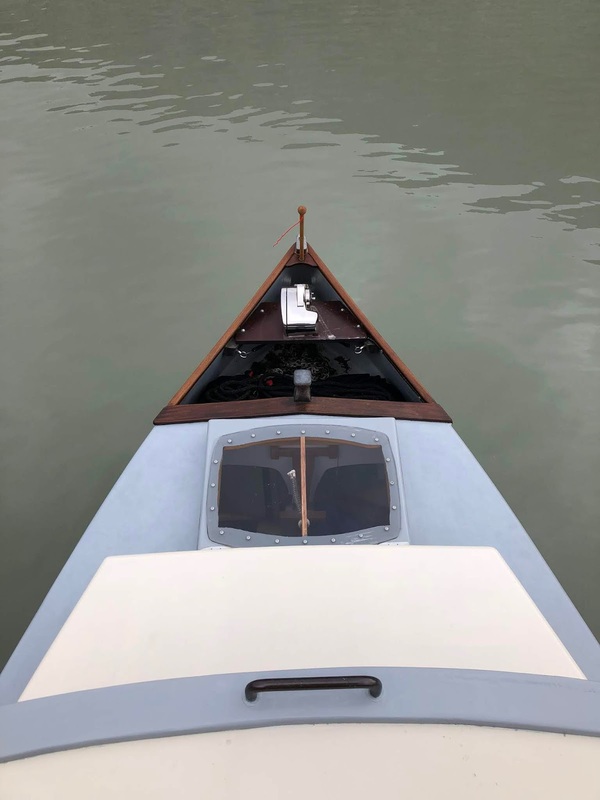 But it was flat calm out there and the weather forecast was benign, so we decided to just keep going and sneak around the GULP! before it woke up. And it wasn’t the only thing sleeping. A couple hours into the passage, Jim said What’s that up ahead… hey, is that a whale? I don’t see a spout. 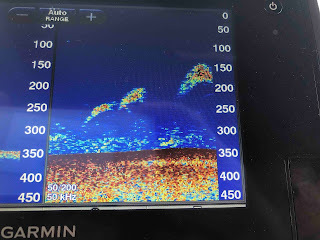 It was indeed a whale, just beneath the surface and sound asleep, right in front of us. 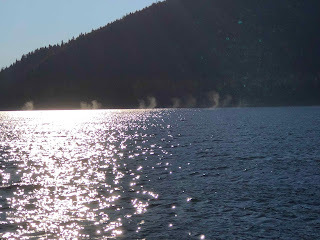 What gave it away was the whale-sized circle of smooth water surrounded by small ripples. 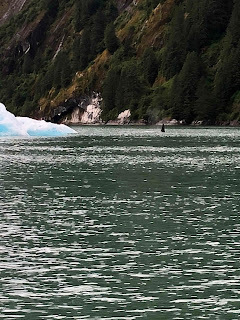 We slowed and swerved to go around it (this being an advantage of a boat doing only 5 or 6 knots) and it woke up. Yeeks! It swam toward us and dived under the boat. Wow! Another couple of whales were feeding just off Cape Decision, same wide open mouths snapping shut and causing us to wear out the word WOW. 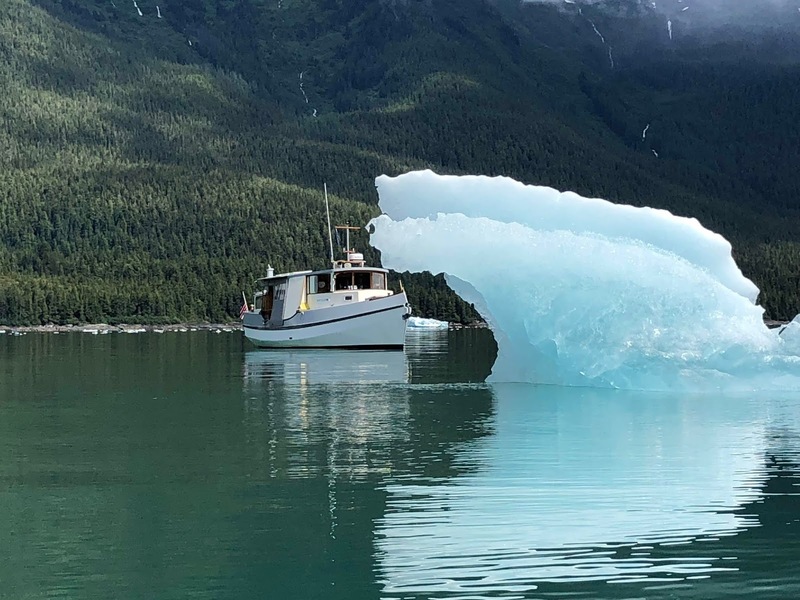 We steamed up Affleck Channel to anchor in the remote and aptly named Bear Harbor, which had, we kid you not, a bear on every beach. It was like Disney’s Kountry Bear Jamboree in there. Bears effortlessly overturning hundred-pound rocks looking for stuff to eat. Bears lumbering around like inebriates leaving their favorite pubs. Bears sniffing, bears scratching, bears slurping, chomping and staring at each other. 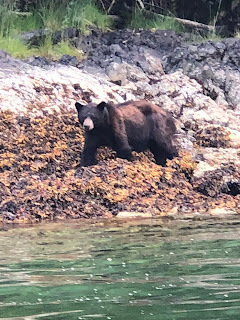 We even watched a bear answer the question, “Does a bear s*** in the woods?” Actually it was on a beach, and as we watched it from the dinghy and kayak, it gave us one of those whatchu lookin’ at? stares. 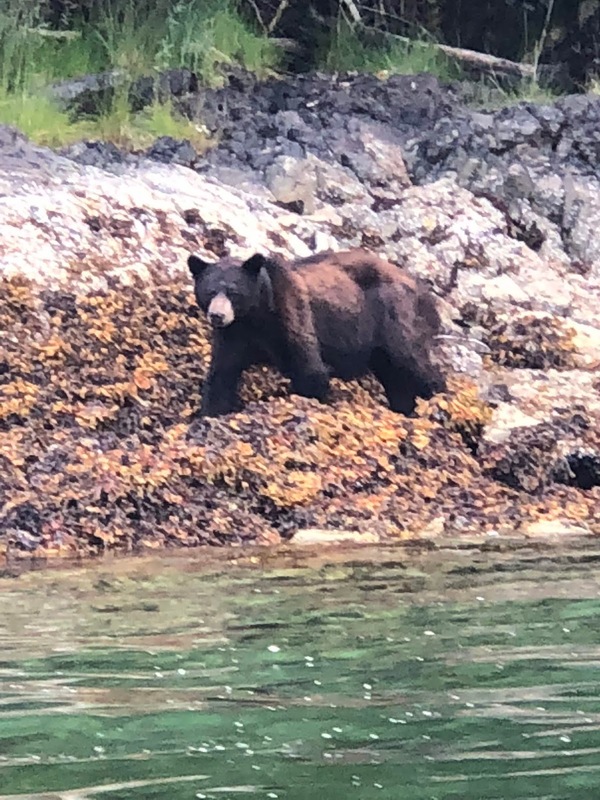 There were so many bears, in fact, (all of them black bears; the two species have claimed separate islands in Southeast Alaska) that Jim would occasionally go, Hm, I haven’t seen a bear in an hour, what’s going on? Thus, dear reader, you might expect, as one would if one used the logic lobe of one’s brain, that if one kayaked ashore in BEAR Harbor, one perhaps *might* encounter a bear, no? Jim: (Points to the island next to where we were anchored) I’m going to kayak to this island over here and do a little hiking. 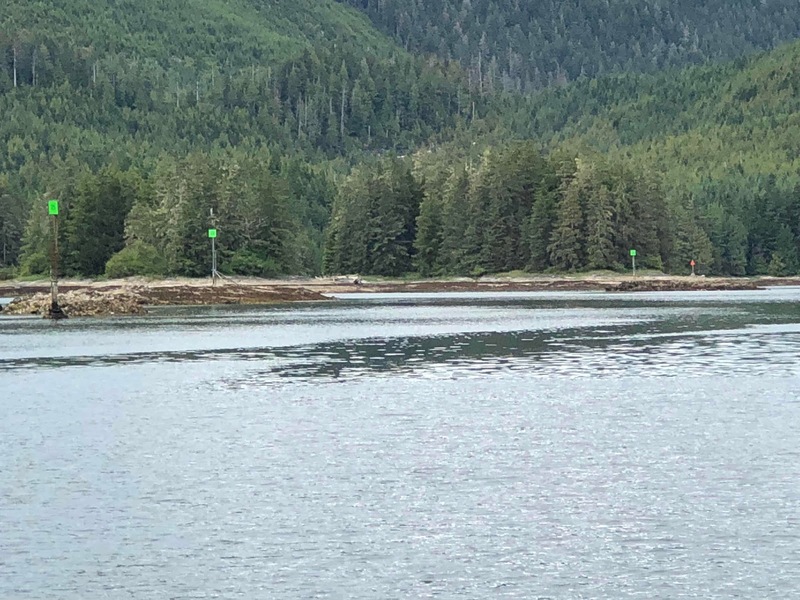 Me: (Points to a neighboring island) There was a bear on the beach over there an hour ago, and the sand bar between the islands is exposed because it’s low tide. Whenever Jim says, “It’ll be okay,” I have learned that a DefCon4 alert is not far in my future. 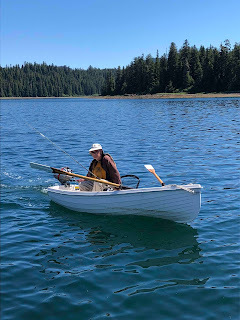 (See blog post on fishing for halibut while dragging anchor.) 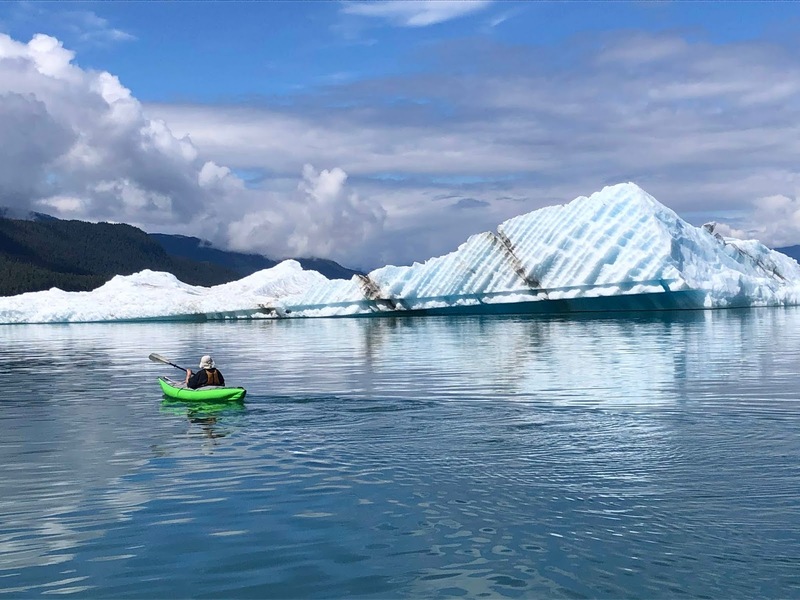 He kayaked ashore, left the kayak on the island’s south end, and went for a walk. Ten minutes pass. I’m on deck, working on the aforementioned mosquito/clydesdale fly net. He’s standing on the island’s north end. Gee, I’m thinking, he got there fast. Me: HI, SWEETIE, ARE YOU HAVING FUN? 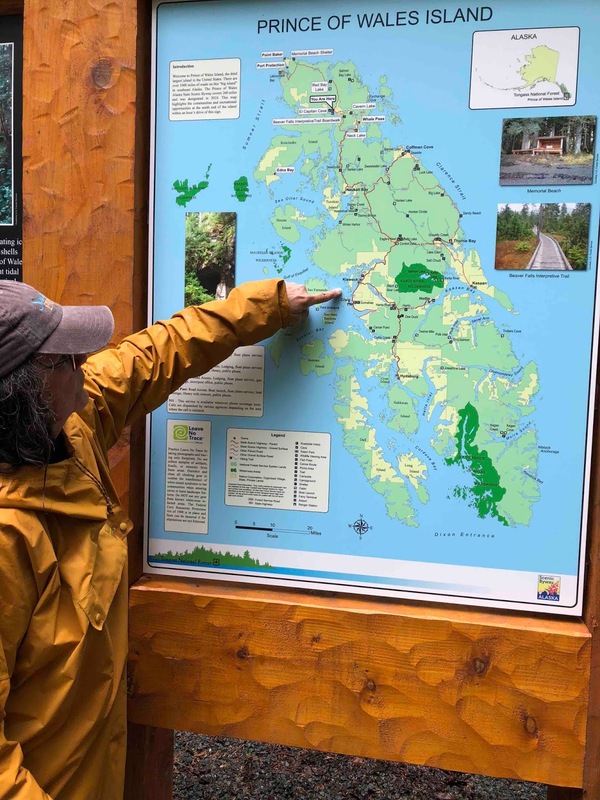 Jim: (points to the island’s south end) THERE’S A BEAR DOWN THERE AND HE’S HEADED FOR THE KAYAK! 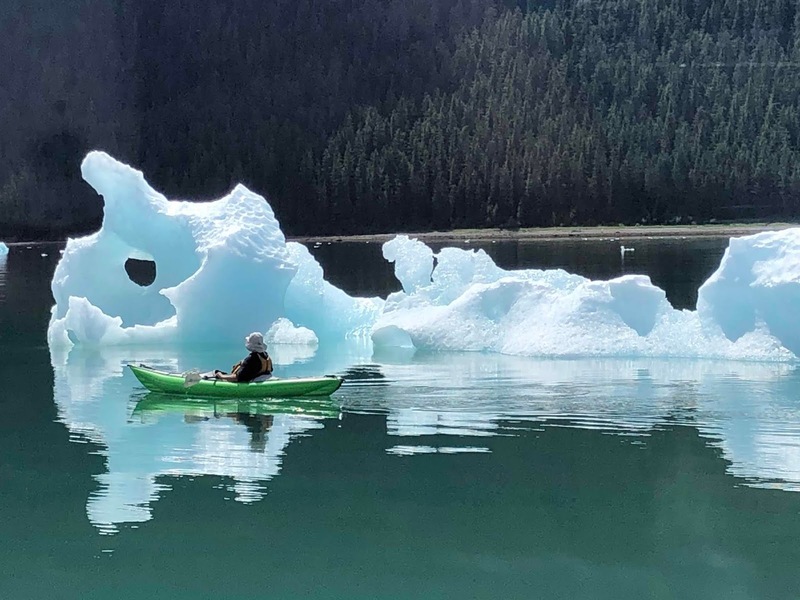 Me: THE BEAR WILL DESTROY THE KAYAK IF HE FINDS IT. Like Wonder Woman I jumped into the dinghy, gave a heroic pull on the outboard’s starter cord, and was astonished to hear it start, given the fact that this is a Jim-centric machine. I picked him up and we motored around to the south end of the island, making ungodly noises to scare off the bear. (This tactic would, of course, not have worked on a brown bear; for one of those we would have waved cheerio and wished it fine dining on its neoprene meal.) 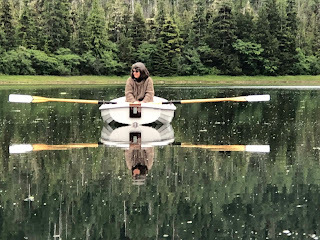 Our noises worked and the bear was not around, so Jim fetched the kayak and I got my husband back, not to mention some comedic material. But jeez, ya know? When surrounded by bears, one should assume they are mobile. 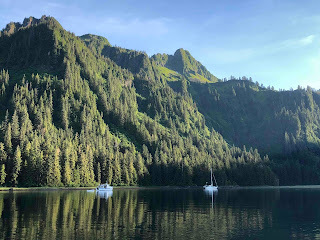 Now, if you have read an earlier blog post on how the lack of a fishing net caused dinner to slip away, literally through Jim’s fingers, you would have had an inkling of my reaction when in Bear Harbor I asked, Where’s the fishing net? and Jim said that the, uh, brand new, very expensive thing had, er, accidentally gone overboard when he’d, ah, um, forgotten that it was atop the back cabin as he pulled the back cover down in a rainstorm. He never heard the plop and I said not a word, but telepathy is real, bebehs. We managed to scoop up a lingcod in a bucket, but it was too small to keep. However, we did score a rockfish using the bucket. We will get a new net. 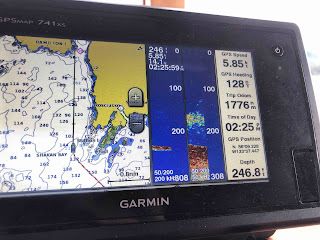 Three days of watching BearTV and we were ready to cross Sumner Strait to Prince of Wales Island. Although we wanted to go see a place called Hole in the Wall, the weather forecast was not good and we didn’t want to get stuck there for several days, so we headed for the narrow shortcut called El Capitan Passage. DUDES! We got 1776 miles on this trip odometer at Hamilton Island! How cool is that! Near its entrance we set the anchor carefully in a small cove to wait out the coming weather front. 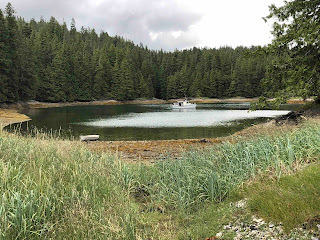 All was well until the next morning when, after a 180 degree wind shift, our anchor (a brand-new Spade) got fouled in a massive double wad of kelp and the boat slowly started dragging, which, in a small cove is not good. 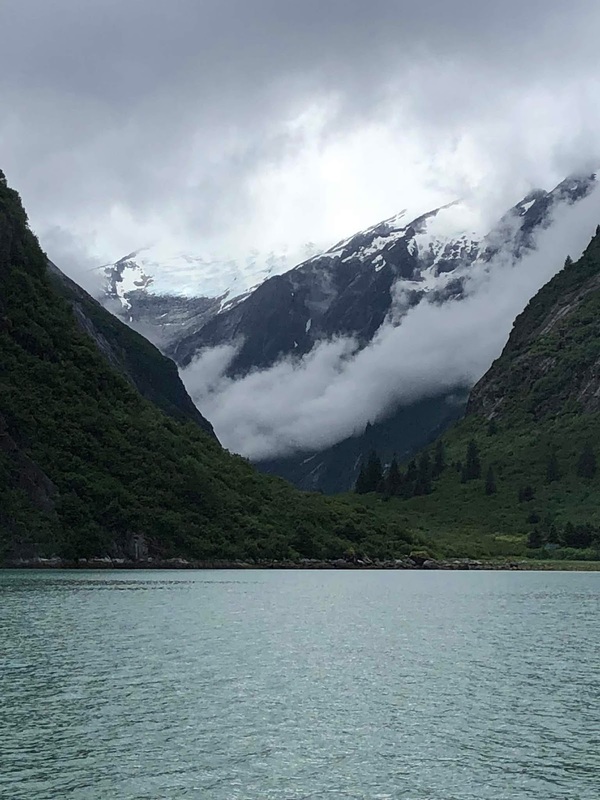 Happily, I had a cup of coffee going and was lucid, and we said, well, let’s just go find a better anchorage, this weather’s not getting any better. Poor Jim had to clear the biggest mess of organic material off our anchor and chain since the time we anchored in a tree in Barkley Sound almost ten years ago. 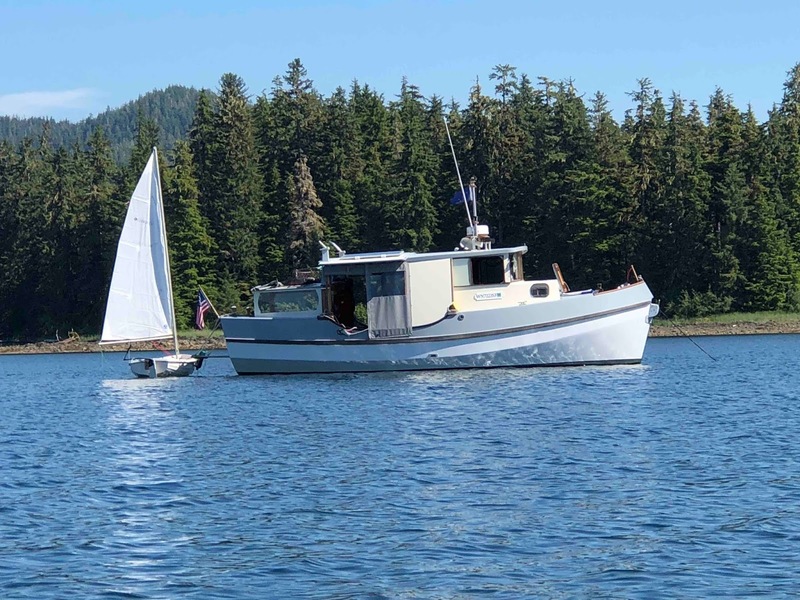 This Spade anchor, by the way, has otherwise been superb, and it scored very high in the now-famous series of underwater video tests on a variety of anchors conducted by Port Townsend’s own Steve Goodwin out in the bay. 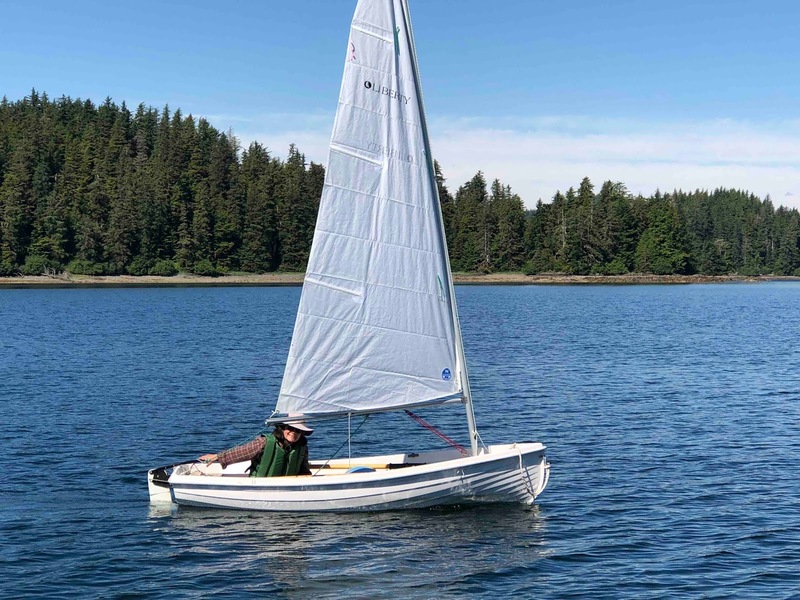 Goodwin now uses a Spade on his own boat, and probably no anchor of any type could have held in that tangled kelp on a wind shift turnover. Coming from the north you leave reds to port and greens to starboard--good to know beforehand. 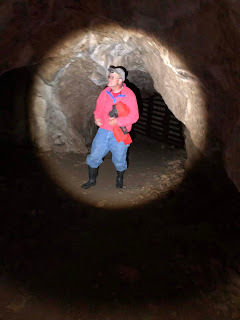 Back to El Capitan Passage. While not as fearsome as the sphincter-puckering Devil’s Elbow in Keku Strait just north of here, the area around what’s called Dry Pass is rock-wacky enough to command your full attention, especially in rain and wind. Besides, who wouldn’t wonder about the sanity of piloting a floating object through something called “Dry”? We found a great spot to anchor with no kelp and lots of sticky mud, and enjoyed the rainy day. 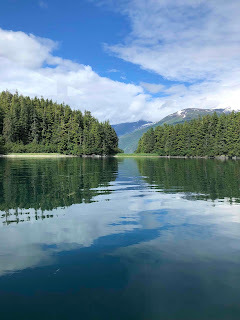 Next morning we motored a couple miles over to the Forest Service’s pier, anchored near it and rowed ashore to explore El Capitan Cave, the largest cave in Alaska. Read this to get a sense of what's in there--talk about Ice Age relics! 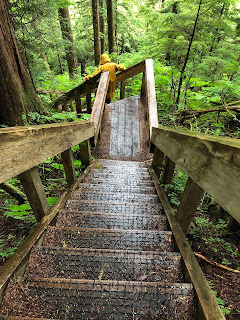 For some reason, both of us had missed the little detail in the cruising guide that says there are 340 large wooden steps going most of the way up the side of a mountain, and there was no sign by the Forest Service advising us of that, so up we went, oblivious. Puffing like a couple of antique steam engines, we reached the top. 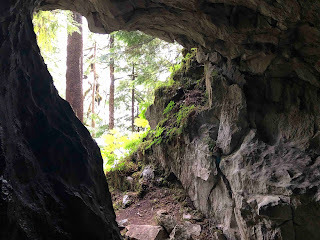 Hikes have not been frequent on this trip due to dense forest (and bears, duh,) and our legs were out of shape. 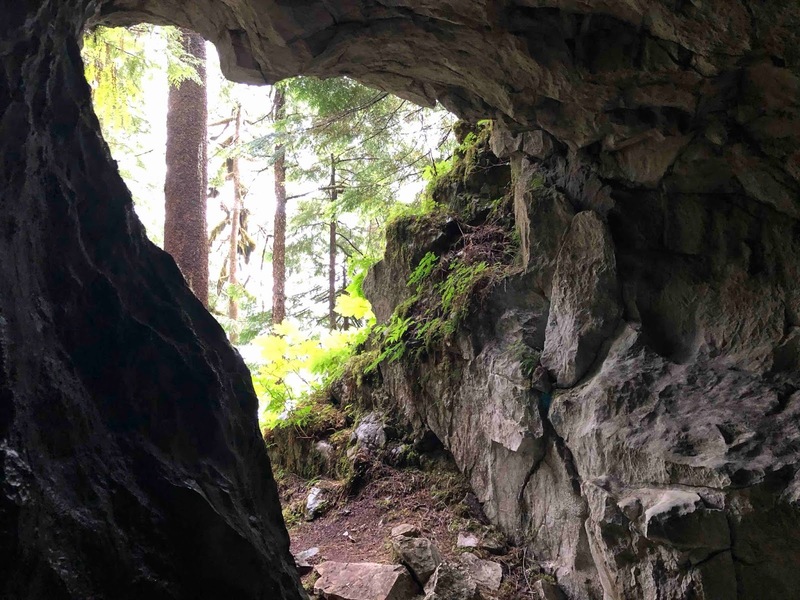 Boy what a view, and wow what a cave. We clambered over some fallen rocks, turned on our flashlights, and went spelunking. 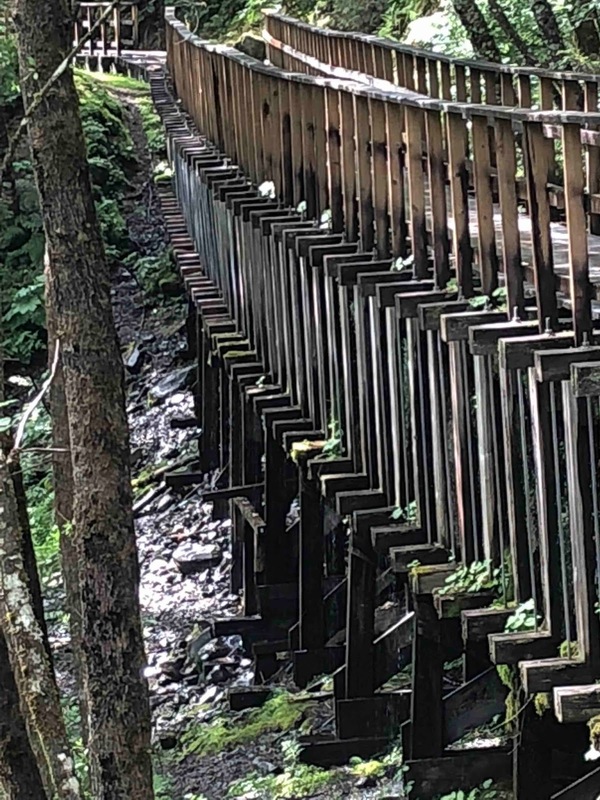 Just like that, nobody around, and there are no lights or railings or other “improvements,” it’s in its original condition, though the fossil bones (some over 11,000 years old and including a giant bear 12,295 years old) and artifacts have been removed for safekeeping. 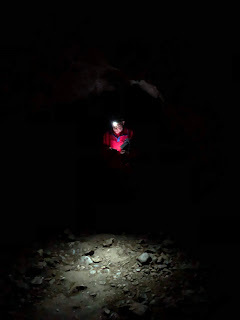 Not to over-state the obvious, but caves are dark, and it’s fun to turn off your lights and try to see your hand in front of your face. There's even a species of shrimp that lives in complete darkness its whole life, in that cave. A small humpback whale was feeding in the outer cove. Next morning we said, let’s just go a short distance and fish the whole way. 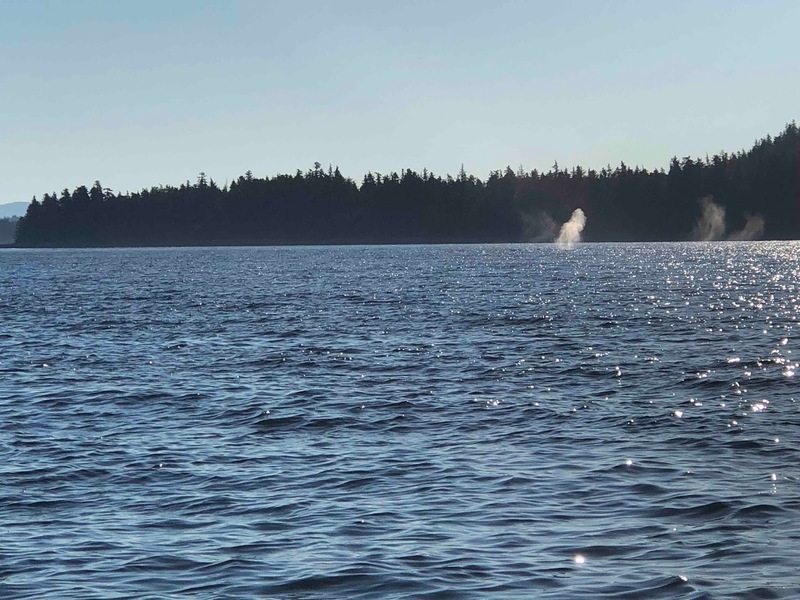 Once underway, we saw the small whale, who was joined by two others. 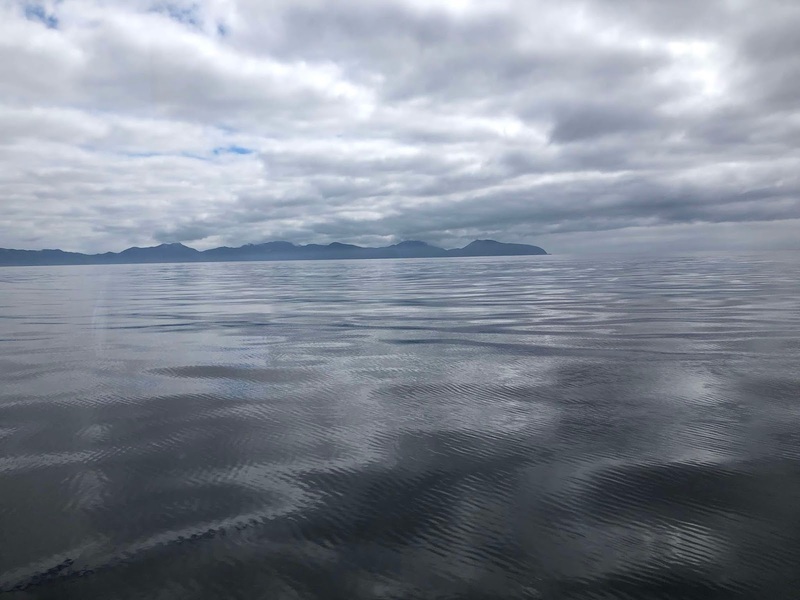 As we trolled near a small island, one of the whales swam toward us and rolled up on its side. Then, as we trolled away from it at about 2 ½ knots, it caught up and swam alongside us the entire length of the island! Ten minutes later as we approached Turn Point, there was a lot of splashing up against the rocks. We didn’t see any waves. A WHALE! ANOTHER ONE, RIGHT UP AGAINST THE ROCKS! Less than two boat lengths from us, it rolled and then opened its mouth and we could see the baleen. Wow! We turned Raven away to give it more room, and it followed us! 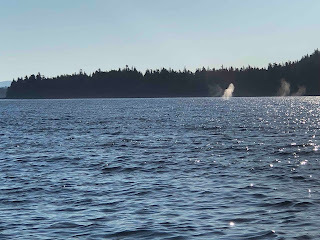 We put our fishing gear away, being so near these whales, and steamed at 4.2 knots, with this whale swimming alongside us (between 50-100 feet away) for almost a mile! 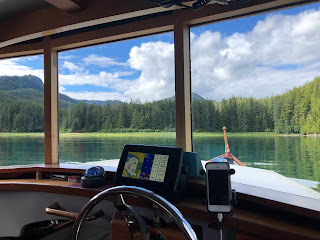 Later on, when it wasn’t around, we fished again, but something snagged our downrigger gear and we lost the weight and cable. (It wasn't a whale.) Another thing to replace in Craig. We will get the hang of this fishing thing one of these decades. 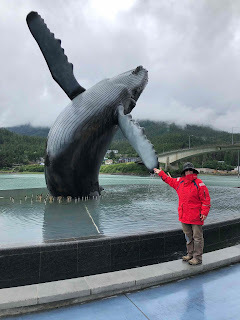 When we got to Nossuk Bay in afternoon wind and rain to find a sheltered place to anchor in one of its nooks, another whale was swimming back and forth in the bay! 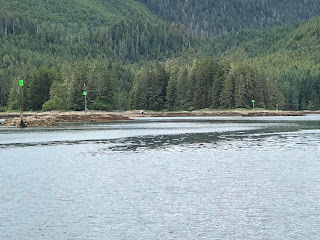 I log whale sightings, and conservatively estimate that since Ketchikan we have had between 76 and 80 whale sightings, not counting ones way, way off in the distance. 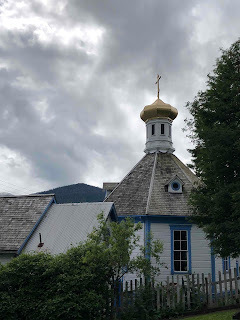 So, I write this on a lay day in Craig, where JobOne was to GET A FREAKIN' HOT SHOWER. Done. 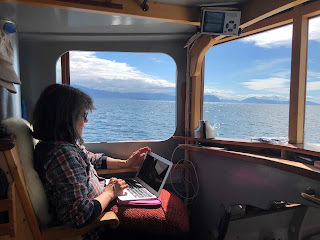 Things like laundry, finding internet to post this blog, provisioning, replacing fishing gear, talking to fishermen to see if they have advice (they do), and FINDING A PUB are on the agenda. Then it's off to the southern part of Prince of Wales Island, to fish, play, wait for a good forecast, and get around Cape Chacon, which sticks out into Dixon Entrance, eventually crossing back over to the "mainland," where we will turn once again toward Prince Rupert, that great little Canadian city. All that will take a couple of weeks. 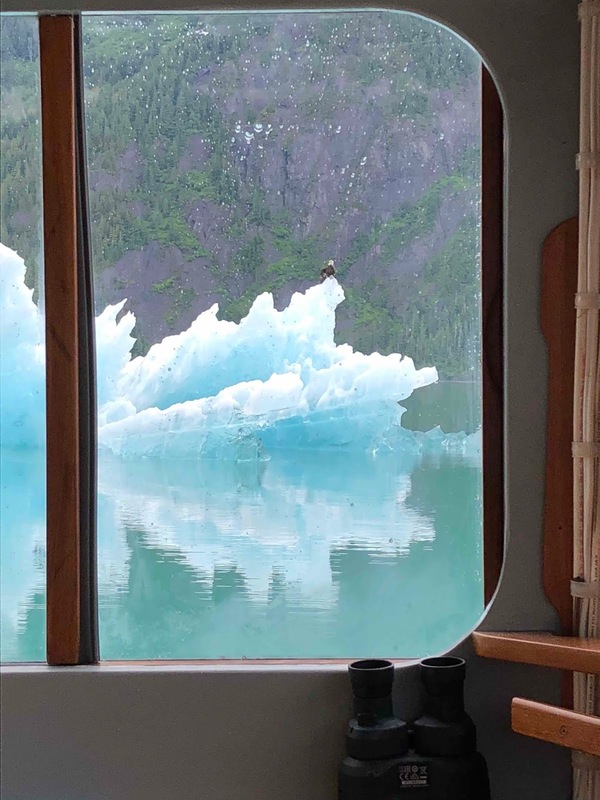 Unspoken Law of the Sea #11: If you have a boat, get out there and enjoy it. If you don't have a boat, get one.